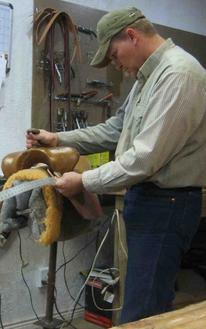 Born and raised in Redmond, Utah, Ross Christensen has been a saddle maker since the 1980's. He grew up around horses and draft teams all his life. Following service in the military, Ross repaired saddles from 1966 through 1987. He took all the problems he found in the many repairs he did, taught himself to make top-quality saddles, and struck out on his own to make hand-made, custom saddles full-time. In 1987, Ross started his business, Christensen Saddlery, from home in Monroe, Utah, where he currently resides with his wife Debbie. His saddles were (and are) so well-loved that though he never advertised at all, he sold saddles throughout the country, just through word-of-mouth. He also taught his son, Dan High, how to build his exquisite saddles since Dan was a little boy. Ross currently works with Dan building saddles and tack, helping out as business continues to flourish. Raised in Monroe, Utah, Dan began working on saddles along side his father since 1987. Since childhood, he has been schooled by his father, well-known saddlemaker Ross Christensen, in crafting durable, comfortable saddles out of only the best leather. From cutting and roping to trail saddles, Dan makes any style of saddle needed by his customers, with any tooling and silver, at very reasonable and competative prices. High Quality Saddles keep their prices low so the average rider out there can afford a $4,500 saddle without spending $4,500. Horses and horse training in general has been a lifelong passion, as he was raised on top of a horse! He takes great pride in his work and it shows in the excellent craftsmanship. Dan also creates one-of-a-kind tack and has extensive skill in saddle and tack repair. He worked for Las Vegas Paving for 8 years while building saddles on the side, but as of January 2008, he and his wife, Ashley, opened High Quality Saddles on a full-time basis. He builds excellent-quality, custom tack, including (but not limited to) chaps, gun scabbards, breaststraps, saddlebags, pouches, cell phone cases, knife scabbards, and just about anything else needed out of leather.